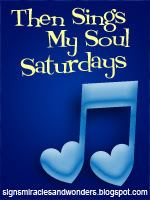 It's Then Sings My Soul Saturday when I link up with Amy of Signs, Miracles and Wonders. As I continue to study Ann Spangler's "Praying the Names of God " the focus for this week was God as Adonay or Lord. Yes, He is my Savior. But Lord of my life? My heart's desire is that He would be the Lord of my life. I want Him to have access to every part of me and allow Him to work in me and through me for His Kingdom purposes. But I've discovered that this is a day to day choice that I have to make. I chose "He is Lord" by Hillsong for today's TSMSS. Amen!! I'm alive 'cause Jesus lives...praise His name! Thanks for the comment on the photo blog too - I just finished posting more pictures of Naomi and Noah! They are TOO cute! Thanks for sharing dear sister! Love you. What an awesome book! I have gone through it randomly and used it in a Bible study. Ann Sprangler's book always touches my heart. Love the song too! He is LORD!! Debbie, I am hearing more and more of this song lately. A couple of other blogs are posting the song. Hmmmmm... blessings to you. A great song choice, Debbie. "Our God will never fail"...such truer words were never spoken! So thankful he is our God and Lord. He Lives! Amen! Great video. Thanks for sharing. Another song I don't think I've ever heard before. Beautiful words. Thanks for sharing this video, it is one of my favorite songs. Great song :) I pray that Jesus is "Lord of my life", too. I've just recently found your blog and would like to make a prayer request. I know that you don't know me, but feel that everyone who prays should be asked to pray. My nephew, who is 9 almost 10, has been having headaches... He had an MRI last week and they found a cyst (that was benign (sp)) and some leisons on his brain. We are not sure what all this means, but God knows, we hope to find out more next week. Please keep his family in your prayers. Thank you! Hillsong music is powerful. Thank you for sharing.